Oil prices are back on the defensive with WTI crude barrels back beneath $68.00 as US inventory supplies bumped higher than expected, adding bearish pressure to oil prices which were already in decline from Monday. Oil prices continue to clatter along the bottom of recent support levels; today's price action will also depend on the Dollar and the EIA's Crude oil inventories. 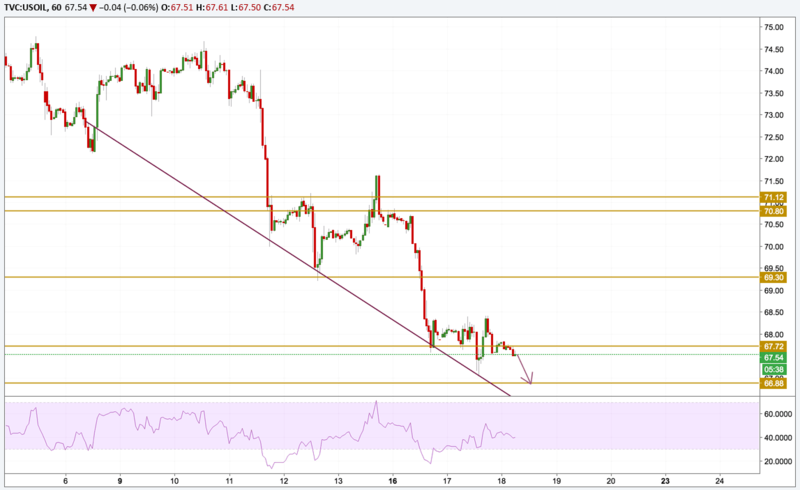 Technically, the price has continued on its downtrend breaking support levels and is currently settling at the $67.50 support area. However, momentum stopped declining, creating a divergence between the price and itself. So a correction to the upside may happen sooner than later but a test of the $66.88 support level should come first.